The latest addition to the Dark Horse horror line is this chilling original graphic novel from writer and publisher Mike Richardson (The Secret, Cravan). Twentysomething Meagan Walters regains consciousness and finds herself locked in an empty room of an old house. She's bleeding from the back of her head, and has no memory of where the wound came from-she'd been at a club with some friends . . . left angrily . . . was she abducted? When Meagan peers through the door's keyhole, she starts to suspect that her captor isn't quite human . 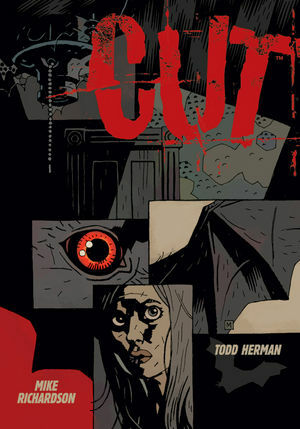 . .
Todd Herman (The Fog; The Goon: Noir) fleshes out the story with his moody, EC-influenced pencils, and comics stalwarts Al Milgrom and Dave Stewart bring them to life. * Original graphic novel by The Mask creator, Mike Richardson, offering an original twist on horror movies like Saw and Hostel.